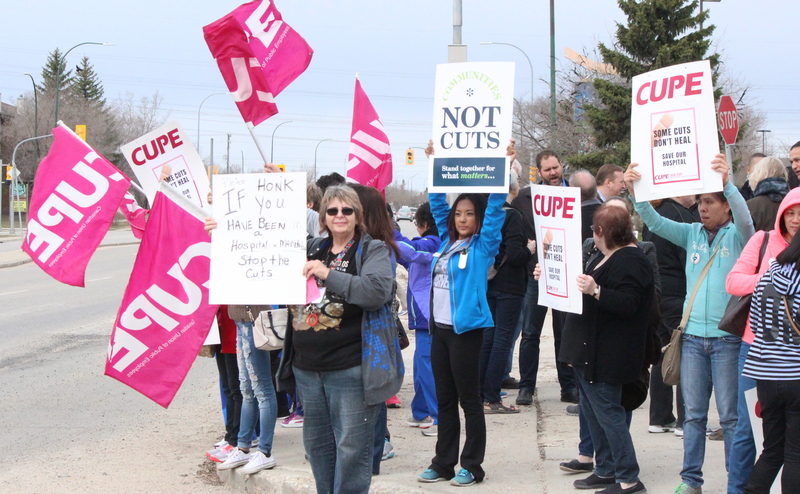 CUPE continues to fight for health care workers across Manitoba! The Provincial Government has finally released the Wait Times Reduction Task Force final report dated November 2017, eight months after the government announced the closure of Emergency Departments and Urgent Care centres in hospitals across Winnipeg. “The Report suggests that the government’s decision in April 2016 to shut ERs was rushed,” says Debbie Boissonneault, President of CUPE 204 representing health care workers across Winnipeg, including at Concordia Hospital, Grace Hospital, Seven Oaks General Hospital, and Health Sciences Centre. The report notes that closing the Concordia and Seven Oaks Emergency Departments (EDs) should be delayed, in particular “if the ED at Seven Oaks General Hospital were to close at the same time as the full closure of Concordia Hospital ED, it would put a monumental burden on the remainder of Winnipeg’s EDs”. “Our primary concern as health care workers is how patients are affected by these changes,” said Boissonneault. The report also highlights concerns that “rapid implementation of consolidation will place a major stress on current resources”. The Regional Health Authorities have been mandated to find millions in “savings” while the government is implementing recommendations from the Peachy Report, the KPMG Report, and the Wait Times Reduction Task Force report. The KPMG consulting report pushes rapid changes to the health care system while the Wait Times Reduction Task Force, with medical doctors at the helm, cautions to “hasten slowly”. One positive aspect of the Wait Times Reduction Task Force is an emphasis on social determinants of health, which include poverty, living conditions, and other socio-economic factors that impact the well-being of communities. WINNIPEG – The Canadian Union of Public Employees is speaking out against changes to the Healthcare Employees’ Pension Plan (HEPP) announced on October 17, 2017. The CUPE Local 204 Election Results are in. We would like to thank to everyone who put their names forward for the CUPE Local 204 elections, and we’re proud to have such strong activists engaged in our union! The next step will be Unit Elections, see here for more details. The Canadian Union of Public Employees (CUPE) received details on the extent of the government’s plans to restructure and reorganise front-line care at Health Sciences Centre (HSC) and Grace Hospital. The changes at HSC includes the reduction of many health care aide positions from full-time to part-time, resulting in the loss of over 100 full-time jobs. At least 111 positions will be cut altogether at HSC alone, leaving entire hospital wards with major reductions in staff. These numbers are still only preliminary as CUPE continues to comb through the stacks of rotation changes provided by the Winnipeg Regional Health Authority (WRHA). CUPE received a vague “Employment Security” notice in August, and met with the employer once to try to discuss the proposed changes. The employer insisted it could not provide any details until the new shift rotations changes were finalized. During the 2016 provincial election Premier Pallister promised that he would protect front line workers. “That election promise has been broken,” said McAteer. CUPE represents support workers at the majority of acute care facilities in Winnipeg, including HSC, Grace Hospital, Seven Oaks General Hospital, Concordia Hospital as well as long-term care facilities and community clinics. Each year the Government of Manitoba proclaims Health Care Support Workers’ Week to celebrate the contributions of front-line health care workers to our province. This year the proclamation comes with a grain of salt: the government’s proclamation occurs at the same time as massive restructuring in health care that will negatively affect front-line health care support staff. While we ourselves honour this important day to celebrate everything CUPE health care support members contribute to Manitoban families, we hope the Minister of Health understands the true spirit of this proclamation, and stops the cuts immediately.